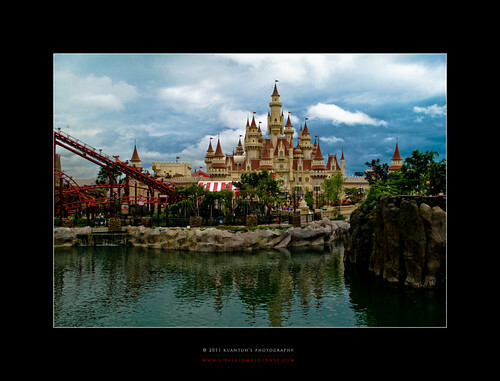 Archives_2005_to_Present #169 – Magical Palace a photo by kuantoh on Flickr. This shot was taken with a Canon G11 in Singapore, 2010. It was a day with fellow Tangshooters at RWS Universal Studios Singapore soft opening. Rain come upon us right as we entered and we were lucky that the skies cleared pretty fast after a short showers. Far far away castle as it was called. Archives_2005_to_Present #135 – Reflections in Autumn a photo by kuantoh on Flickr. 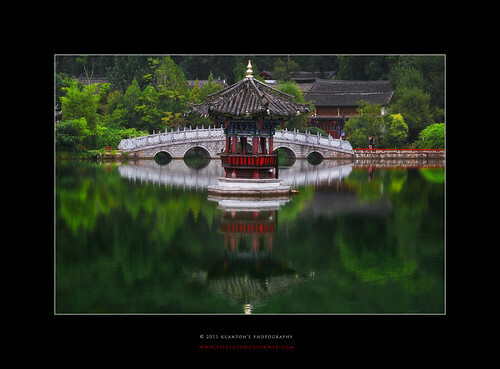 This shot was taken with a Canon G10 in Lijiang, Yunnan, China, 2009. Taken in Lijiang within a park in the premises of the elephant hills, this shot was taken with Canon G10 zoom at the maximum. Waters were extremely still, perfect reflections, beautiful colors of the surroundings. A touch of zen. Archives_2005_to_Present #134 – Home in the Mountains a photo by kuantoh on Flickr. 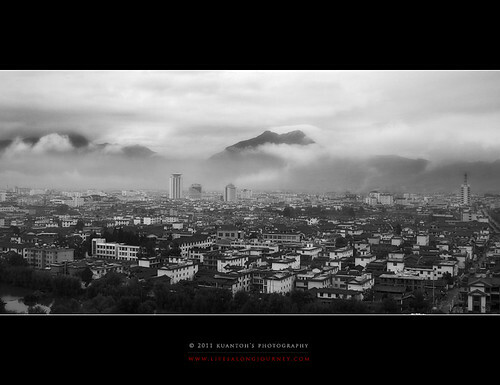 Taken in Lijiang from the top of elephant hills. Steep uphill climb, but to locals, it appears that it is a daily routine climb up every morning. Wishing for clear blue skies but gotten dreamy clouds with the backdrop of Yulong Snow Mountain. Home in the mountains. Archives_2005_to_Present #133 – Man Versus Wild a photo by kuantoh on Flickr. 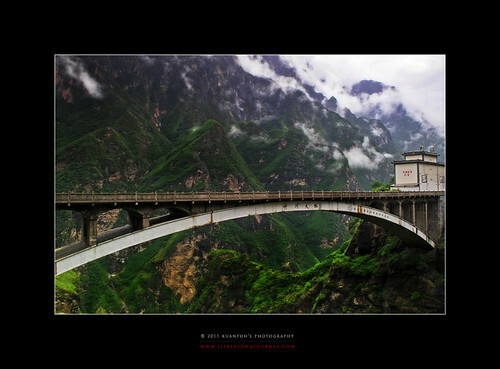 This shot was taken with a Canon G10 in Tiger Leaping Gorge, Yunnan, China, 2009. 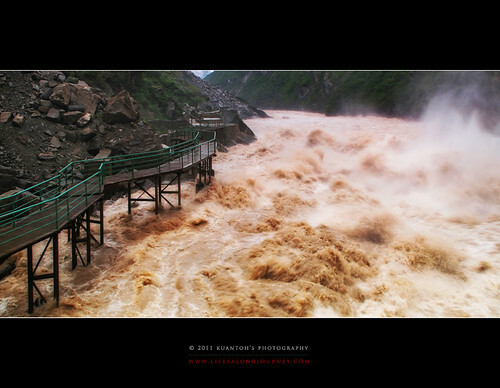 Taken at the Lower Tiger Leaping Gorge, this shot emphasizes the man against the forces of nature. How such sheer architecture is built against the strong currents, how long can the structure withstand the forces of nature? Question of time. 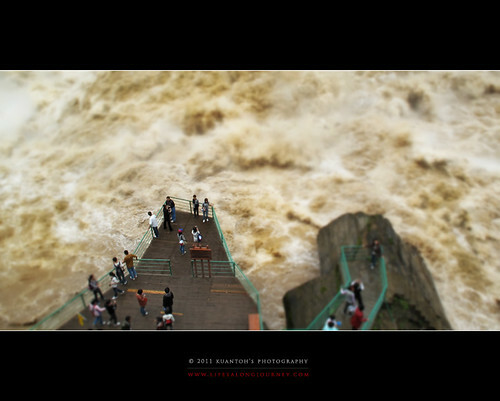 Archives_2005_to_Present #132 – Nature’s Currents a photo by kuantoh on Flickr. Archives_2005_to_Present #131 – Bridge to Heavens a photo by kuantoh on Flickr. This was taken after we reached the lower portion of TLG (Tiger Leaping Gorge) in midst of rain and driver navigating through rough terrain with risk of landslides. Tina’s Guesthouse is one of the stops that most backpackers would camp by for the night after taking the high trek. Took the trek in 2007 and in 2009 we passed by this zone but never stayed. It’s amazing how the bridge linked across the ferocious gorge below and remained functional over the years in the midst of horrendous weather and climate. Set with the background of mountains and clouds, this is indeed a link to the heavens. 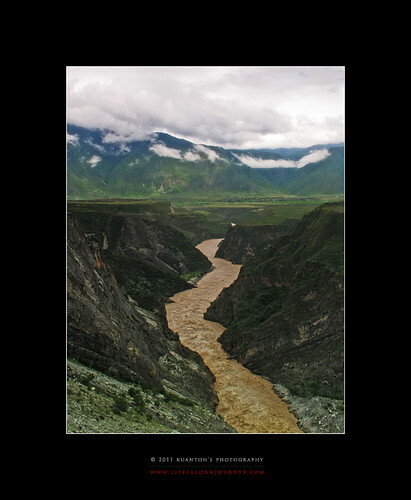 Archives_2005_to_Present #130 – Of Mountains, Clouds and Meandering Rivers a photo by kuantoh on Flickr. This was taken after we reached the lower portion of TLG (Tiger Leaping Gorge) in midst of rain and driver navigating through rough terrain with risk of landslides. The meandering rivers, and plateaus, complemented by the mountains in the background make just a picturesque landscape even with my G10.